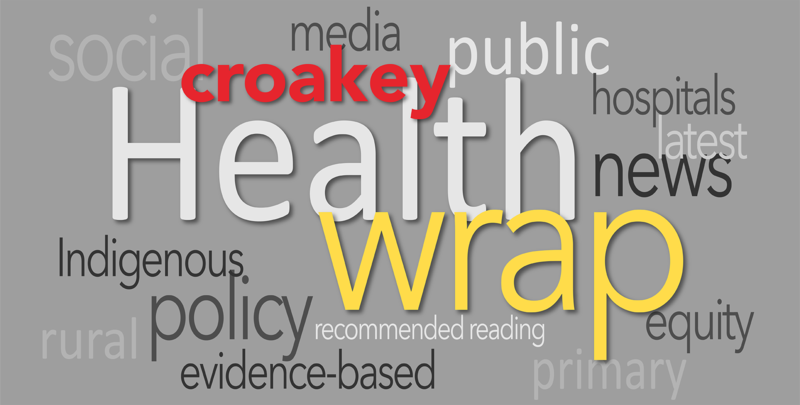 In the latest edition of The Health Wrap, Associate Professor Lesley Rusell puts out a call for strengths-based news in Indigenous health, reviews a fracas over complementary medicine regulation, and spotlights the latest gun control debate from the United States. 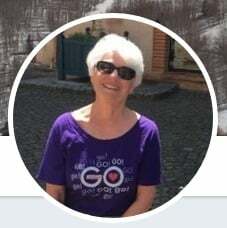 Beneath her column are some links to other recommended reading and resources from the Croakey team, and some “tweets of note”. For many Australians, the most important issues over the past fortnight have been raised by the 2018 Closing the Gap report, and the Closing the Gap Campaign’s 10-year review of the strategy. Croakey and other outlets such as IndigenousX have provided some excellent analyses and commentaries. I urge you to read them. One way to highlight the way forward and drive effective solutions is to emphasise what is known about what works to improve outcomes for Aboriginal and Torres Strait Islander people, to focus and build on the positive rather than the failures. The Health Wrap is committed to this approach; we plan to include regular items highlighting programs, projects, communities, and individual experts making a difference. Meanwhile, start with the good news stories that NACCHO has collected and a recent article at The Conversation about three programs that work. As well, the National Drug and Alcohol Research Centre at UNSW is asking Aboriginal and Torres Strait Islander students to share their positive stories as part of a new project to develop a culturally inclusive school-based drug and alcohol prevention program. Reforms to the regulation of complementary medicines – needed changes or a win for snake oil salesmen? If you have been seeing tweets like these, then maybe you wondered what was behind them. Or perhaps you saw the concerns expressed in Croakey that that the Therapeutic Goods Amendment (2017 Measures No. 1) Bill that was passed recently gives a green light to pseudo-science. Easing regulatory requirements that are seen as a barrier to business and innovation. Ensuring a level of regulation commensurate with the potential risks to public health and safety posed by complementary medicines. Ensuring consumers and health professionals have sufficient accurate information to enable them to select and use complementary medicines safely and effectively. In September 2016, the TGA announced a process to reform to the regulation of complementary medicines. These proposed reforms were as much about easing the regulatory burden on industry as increasing the information available to consumers about efficacy. Although the word “safety” appears in one of the headings of this announcement, it is nowhere else, and the focus in clearly on “efficacy”. The introduction of a new class of complementary medicines where evidence for efficacy for these products is evaluated by TGA prior to their market authorisation was forecast. There are some interesting up-front questions about how complementary medicines are defined, what constitutes a “clearly established and traditional use” for an active ingredient, and on what basis a “risk-based approach” to regulation of these products is implemented. None of these issues is addressed in the proposed reforms. A presentation made by Michael Shum, the Director of Complementary Medicines Reforms at TGA in August 2017, is an effective summary of what the TGA wanted to achieve under the reforms. More information, provided in December 2017, about past, current and future efforts is available here. The enabling legislation was referred to the Senate Community Affairs Committee in November 2017. The Committee reported in early 2018. The proposed changes to legislation drew concerns that were expressed in a public forum that was summarised in Croakey in early January this year. 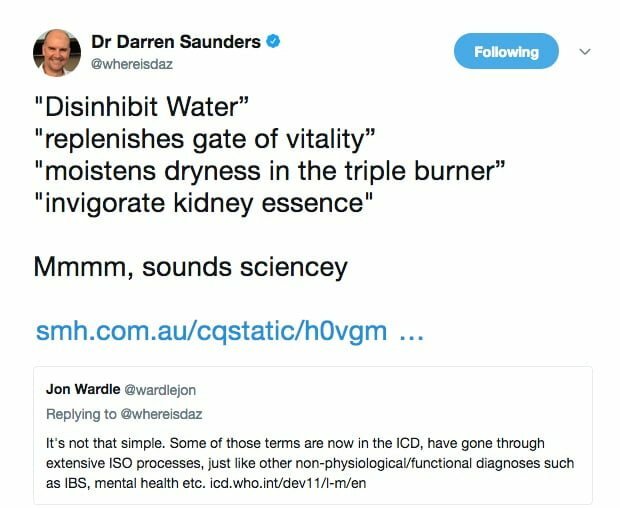 A particular issue of contention, highlighted in the tweets above, relates to the list of permitted indications which has been drawn up and from which sponsors of complementary medicines must exclusively draw for products approved for sale in Australia. The draft list of over 1000 permitted claims was first compiled in 2017 but has only received the attention it deserves this year as the enacting legislation has come up in parliament. The stated purpose is to ensure consumers are not mislead and that only “low-level” indications are used for these products that do not undergo premarket assessment. However it’s hard to know what most people would make of the language and what scientists would make of the evidence base for these claims. 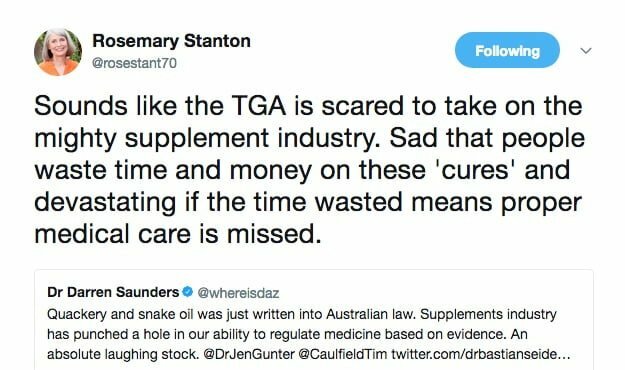 With apologies to the few activists like Dr Ken Harvey who were paying attention and did speak out, this issue highlights why those who care about good, evidence-based regulations for health products must always be alert to government reviews and reforms. Otherwise they slip right under the radar. Tasmania goes to the polls on 3 March with new Labor Leader Rebecca White trying to prevent Premier Will Hodgman from becoming only the second Liberal to win a second consecutive election. Fixing Tasmania’s ailing healthcare system is a high priority for voters; other key issues include the environment, education, the cost of living and affordable housing and pokies. In the fierce partisan fight over healthcare, big promises are being made and large sums of money are being committed. However, closer examination reveals that the spending may be more about Band-Aids to deliver quick fixes than sustainable investments in population health and improved health outcomes. It’s probably fair to say that Tasmania’s public hospital system is a mess, underfunded and understaffed. Health professionals claim that bed block, ambulance ramping and under-staffing have led to patients’ deaths. A recent independent report into the Tasmanian Health Service highlighted dysfunction in the organisation’s executive which is causing it to operate ineffectively. These are not recent problems. In 2011 the Tasmanian Government announced cuts of $500 million over four years to healthcare, although the savings target was reduced to $380 million in the 2012 budget. Then, in June 2012, the Gillard Federal Government announced that it would provide an extra $325 million over four years to Tasmania’s healthcare system. The majority of funding was to be spent on better community-based care, improved discharge care and workforce. Tasmanians are older, less well-off, and in poorer health than most Australians. They are particularly affected by high rates of lifestyle factors for chronic conditions such as smoking, poor nutrition, alcohol use, inactivity, obesity, mental health issues and socioeconomic disadvantage. They have lower health literacy levels and often an unwillingness or inability to travel to healthcare services. All the evidence indicates that an increased focus on prevention, primary care and the social determinants of health is what is needed to improve population health and individual health outcomes. Yet these needs are almost completely ignored in the healthcare commitments made in this election campaign. The focus is on acute care and hospital beds. The employment of an additional 500 health professionals. A two-year trial of free hospital buses for West Coast residents to access health-care. “Medi-hotels” as a form of step-down / sub-acute care for hospital patients. 1332 additional staff – 802 nurses, 158 doctors and 128 allied health professionals. Separately the Liberals have also announced $95 million over six years for a mental health package. Again, this is primarily focused on acute care, including a 16-bed adolescent unit in Hobart. There is a heated fight over what these packages will mean. Much of the Liberal package is backloaded and will not be delivered in full until 2022; over the next three years, the two packages spend more or less the same amount. During campaign visits from Bill Shorten and Catherine King, Federal Labor has announced that, in government, it will provide $30 million to halve Tasmania’s hospital surgery lists and would fund a public abortion clinic as part of the public hospital system so women would not need to travel interstate to obtain an affordable pregnancy termination. This idea has been rejected by Premier Hodgman who says that there are still two private providers of abortions in Tasmania. The Labor Party has announced it would remove poker machines from pubs and clubs within five years if elected. This has generated a contentious debate with claims and counter claims about what this would mean for investment in pubs and clubs, the money made by pokies, the cost of poker machine licences, the number of jobs at risk, and political donations by the gambling industry. There are many doctors in Tasmania who see problem gambling as a public health issue. The Tasmanian Chair of the RACGP has said that reducing the availability of poker machines would improve the health of the whole community. It is increasingly common for GPs to ask their patients about gambling when doing a health check because it is a potential lifestyle risk, leading to increased rates of smoking, alcohol misuse and domestic violence and possibly mental health issues. Make sure to follow @WePublicHealth this week for news from @TasCOSS on #TasVotes. Once again, America confronts a school shooting. What will bring change? For Americans, the deadly school shooting in Florida has dominated the news. The key issue is whether this will result in needed changes to gun control laws. The push for change, which Obama was unable to deliver and Trump – to date – has been unwilling to deliver, is driven by the young students who have survived this and other tragedies or who fear the next such tragedy. Maybe, just maybe, this time will bring some change. But, as Tom Friedman has pointed out, it will be very difficult. An article in our local paper in Colorado (a blue state) highlights the other side of the debate. While around the nation the power of young Americans’ voices is being heard, it is being met by the power of the National Rifle Association (NRA) and its allies. Right wing media are making nasty attacks on the young protesters (none nastier than @dineshdsouza); Florida Governor Rick Scott has an A+ rating from the NRA and the state has banned cities and counties from imposing their own gun-control rules, and many congressmen who receive substantial funding from the NRA have no answers when asked what they will do to address gun massacres. The biggest obstacle to action is President Trump himself. He has directed the Justice Department to propose regulations to ban bump stocks (but he could have asked Congress to do this directly) and he sees mental health as a central issue (but fails to acknowledge that he has cut mental health funding and rescinded Obama’s regulation aimed at keeping guns out of the hands of severely mentally ill people). As well, doctors state that the vast majority of gun violence has nothing to do with mental illness. A push for the death penalty for the perpetrator of the Florida school shooting will surely see the ‘he was mentally deranged’ argument abandoned. Most recently, Trump has espoused the NRA line, that arming teachers and school officials is the answer. Significant change will take time. The best hope for this might be that many of the teenagers who are speaking out will be eligible to vote in the November midterm elections. Also encouraging is the push-back by major corporations cutting ties with the NRA. • Previous editions of The Health Wrap can be read here. • George Monbiot writes in The Guardian about an English town, Frome in Somerset, where preliminary evidence suggests that “when isolated people who have health problems are supported by community groups and volunteers, the number of emergency admissions to hospital falls”. • Dr Vanessa Lee from the University of Sydney writes at Power to Persuade about the political determinants of health for Aboriginal and Torres Strait Islander women, arguing that “Australia will never be a whole, functioning society until institutionalised oppression ceases”. • A powerful article by an English health economist Chris Gibbons describes his elderly father’s health crisis, and suggests there is a significant opportunity cost when health dollars are spent on shiny new high-tech innovations rather than the human care that is so important for vulnerable people. • Robert Manne has written a detailed, gripping account of throat cancer surgery and its aftermath in the March edition of The Monthly (worth buying the magazine for this if you are not already a subscriber, or read the full account in his collection of essays, On Borrowed Time). It is also a moving reflection on loving relationships. • Also in The Monthly is a must-read article by former Senator Scott Ludlum taking us inside the sausage-making machine of Parliament, with reflections sure to be of interest and use to many Croakey readers. Croakey also appreciated his pithy observations on the state of the media – including that “commercial pressures and management culture are disembowelling Fairfax mastheads” while the “ABC lies permanently besieged by circling predators, some of them now well inside the gates”. 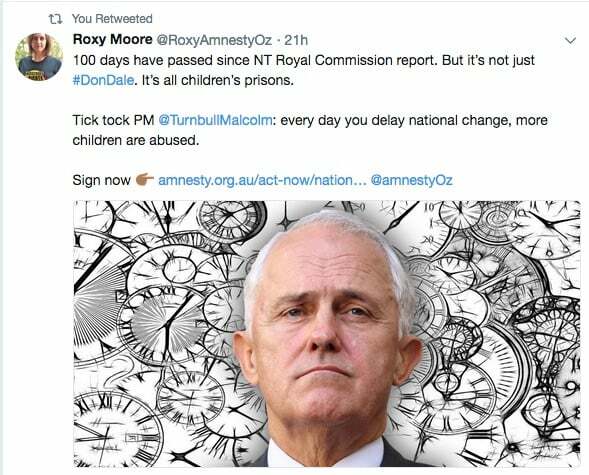 • A new report from Amnesty International, The State of the World’s Human Rights, highlights that Australia’s justice system continues to fail Indigenous people, especially children, and also describes ongoing abuses of the human rights of asylum seekers. According to The Guardian, the report paints a grim picture of the state of human rights globally, arguing that “hate-filled narratives by governments around the world” have given licence to bigotry and discrimination against already-vulnerable groups. • Subscribe to Planetary Health Alliance newsletter here. • Support the “Hands off our charities” campaign here. Diagnosis versus care: What do we need to know to advance health systems of today and the future?